Now in Marathi, in the game of cricket, having scored 99 runs, when a batsman stands poised on the threshold of that much coveted century, he experiences the moment that is best associated with Ganesha. Fear and uncertainty envelope him, between him and his achievement stand hurdles, both real and imaginary, a possible spin from the bowler can overwhelm him, his own anxiety can paralyze him, cheering fans can distract him. He needs divine intervention then. He needs to focus, get rid of all hurdles, perform, get the final run and achieve what he so longs for. In other words, he needs to think of Ganapati. 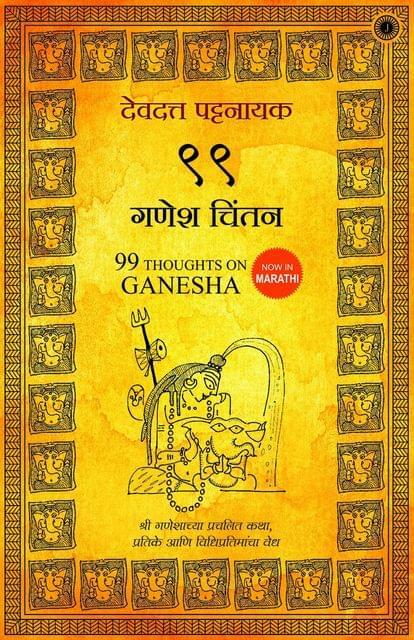 This book brings together 99 meditations to better understand the stories, symbols and rituals of that adorable elephant-headed Hindu god who removes hurdles and brings prosperity and peace. Known variously as Ganapati, Gajanana, Vinayaka or Pillayar, he can help all of us score a century in the game called life.